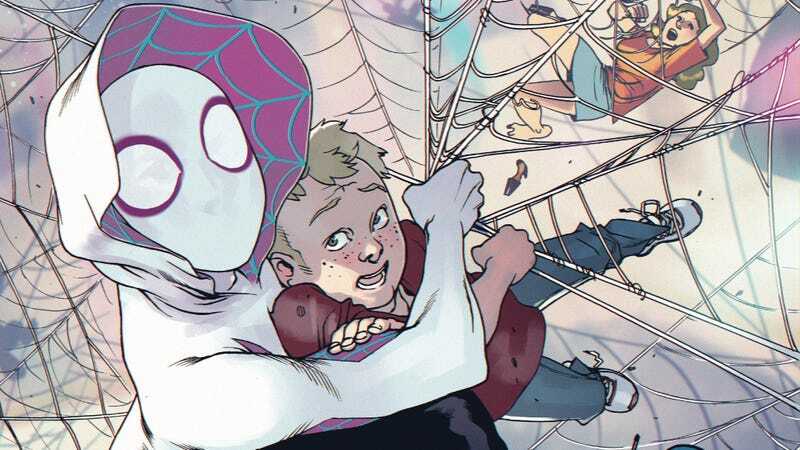 Spider-Gwen has become a household name after the success of Spider-Man: Into The Spider-Verse, and fans who want to see more of her should be reading the Spider-Gwen: Ghost Spider comic book. It offers an intriguing look at a young adult superhero trying to balance her personal life with her superhero obligations. While this new volume unfortunately began with a not particularly new-reader-friendly arc tying into the Spider-Geddon event, the series has become much more accessible as it settles back into Gwen Stacy’s everyday life. A lot of complications have arisen now that her civilian identity is public, and writer Seanan McGuire has used this new status quo to add new dimensions to Gwen’s relationships with the people she’s closest to while also throwing new challenges her way. Joined by artist Takeshi Miyazawa, colorist Ian Herring, and letterer Clayton Cowles, McGuire has paved a new path for Gwen while maintaining the voice of the previous creative team. This exclusive preview of next week’s Spider-Gwen: Ghost Spider #7 shows Gwen trying to achieve some sense of normalcy by going on a dinner date with Harry Osborn, but the night quickly goes south when the restaurant refuses to serve a superhero. This excerpt takes advantage of Miyazawa’s exceptional character acting, and he evocatively navigates Gwen’s emotional journey as she goes from excitement to shame over the course of the evening. We only get a quick shot of Gwen swinging, but it shows how well Miyazawa draws this costume in action. Herring and Miyazawa worked together on Ms. Marvel, and Herring knows how to color Miyazawa’s linework to enrich the shapes while accentuating emotional beats. He makes great use of bokeh lighting effects to heighten the romance between Gwen and Harry, and even when new tension enters this relationship, the lighting keeps their interactions soft and affectionate.